In 2013, two of my favorite cigars happened to be Abaddon and Ouroboros, both of which are made exclusively for Blue Havana, a tobacconist in the Lakeview neighborhood of Chicago (not far from where I live). They were blended by Chris Schedel with help from Skip Martin of RoMa Craft Tobac. Both are made at Martin’s Fabrica de Tabacos Nica Sueño in Estelí. And both are to blame for sparking my admiration for RoMa—a healthy obsession that continues to this day. RoMa’s fine cigar brands—including Intemperance, CroMagnon, and Aquitaine—are available at many tobacconists (a number, I’d bet, that’s growing, if Skip Martin’s Facebook posts from the just-concluded IPCPR Trade Show are any indication). For a time, Abaddon and Ouroboros could only be purchased in-person at the Chicago shop. Now, fortunately, everyone has access to these exclusive blends via Blue Havana’s online store. Abaddon is named for the dwelling place of the dead in the Hebrew Bible and features a Nicaraguan hybrid (Criollo/Corojo) wrapper. Ouroboros is named for an ancient symbol of a dragon eating its own tail and is wrapped in a Brazilian Mata Fina leaf. Until last fall, both were only available in a single size (6.25 x 52). Now they are also available in a Lancero format. Covering the Ouroboros Lancero’s Indonesian binder and filler tobaccos from Nicaragua and the Dominican Republic is a rustic, lumpy wrapper with few veins and highly visible seams. Pre-light notes of smoky molasses emanate from the closed foot. A V-cut is all that’s needed at the head to reveal a smooth cold draw. The opening flavor is gritty with ample pepper spice and black coffee. The sandy texture fades after a half-inch, giving way to a creamier mouthfeel while still maintaining full body. Espresso, roasted nut, cayenne heat, earth, and paprika come and go. Like the original Ouroboros size, the Lancero does not increase in intensity in the final third; rather, the finale is characterized by the welcome additions of cream and cedar. That’s a nice change of pace. And I think most seasoned cigar veterans will agree this cigar is teeming with strength, balance, and complexity. 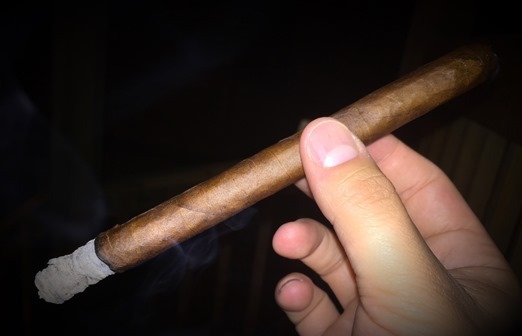 With superb combustion properties and a price tag around $9, this isn’t a cigar you want to miss—especially if, like me, you’re a fan of RoMa Craft Tobac. I continue to love this blend, and the thin, elegant format serves it well. The Ouroboros Lancero is worthy of a stellar rating of four and a half stogies out of five.